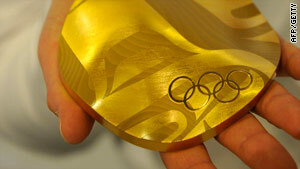 The gold medals at the Winter Olympic Games in Vancouver contain 1.52 percent gold recovered from e-waste. (CNN) -- The champions at the Winter Olympic Games in Vancouver can stand on the podium proud of their achievements, but the eco-minded among them can be extra proud that their medals are made with traces of precious metals recovered from e-waste. The amounts may be tiny (just 1.52 percent in the gold medals) but they provide a shiny example of how precious metals recovered from disused circuit boards from electronic devices can be re-used. According to a new report, however, a more universal solution to a growing problem needs to be found. The report published this week by the United National Environment Program (UNEP) says that in 10 years e-waste from old computers is set to increase by 400 percent in China and South Africa from 2007 levels, and by 500 percent in India. Based on 11 countries in Asia, Africa and Latin America the report warns that in countries with relatively little e-waste today -- such as Kenya, Peru, Senegal and Uganda -- it will soon be a huge problem. Those nations can expect e-waste to increase from PCs alone four-fold by 2020. Around 40 million tons of e-waste are produced each year, with much of it unaccounted for, according to findings by Solving The E-waste Problem (Steps), a UN-initiative supported by many major electronics companies. While often dumping grounds for e-waste exported from the EU and the U.S., countries such as China and India also will have to deal with a huge growth in home-produced e-waste fueled by a boom in sales of electronics. The UNEP report states that much of the e-waste in developing economies is not handled safely, often incinerated and exposing workers and the local environment to hazardous chemicals and toxins. How much money we are wasting here by not properly recycling e-waste and letting it go to landfills? "China is not alone in facing a serious challenge. India, Brazil, Mexico and others may also face rising environmental damage and health problems if e-waste recycling is left to the vagaries of the informal sector," Achim Steiner, Executive Director of UNEP said in the report. According to Steps, China has 2 million of these backyard dismantlers and recyclers, far greater than the official regulated sector. "We need to find a way to keep them in the business to earn a living. E-waste recycling is a rather complex process requiring a lot of capacity, technologies and knowledge," said Ruediger Kuehr, of the United Nations University. "But easy steps can be taken so people and the environment in the informal sector don't suffer harm." Kuehr believes most of the short-term solutions come from better training and infrastructure for the informal sector workers, but longer term needs more international coordination and better local enforcement. If done correctly it could be a money-spinner for those involved in every part of e-waste disposal and recycling operations. "One person's waste can be another's raw material. The challenge of dealing with e-waste represents an important step in the transition to a green economy," Konrad Osterwalder, U.N. under-secretary general, said in the report. "Smart new technologies and mechanisms, which, combined with national and international policies, can transform waste into assets, creating new businesses with decent green jobs. In the process, countries can help cut pollution linked with mining and manufacturing, and with the disposal of old devices." One idea is to put greater responsibility on the companies that produce the goods, which Kuehr suggests could be in their long-term interests as well. "Instead of purchasing the product, we are only purchasing the service the product provides. So it's then in the interests of the companies to see the equipment returned from the consumer when they have new developments. It's a different system. It shifts responsibility from the consumer to the producer." In the short term, it may be that Winter Olympic champions remain in the minority of those safely getting their hands on e-waste gold. Yet the amount of money involved and greater awareness makes Kuehr hopeful they won't be the only ones. "How much money we are wasting here by not properly recycling and letting it go to landfills? If we only look at the PC sector, it is gold worth in the hundreds of millions that we are wasting," he said.